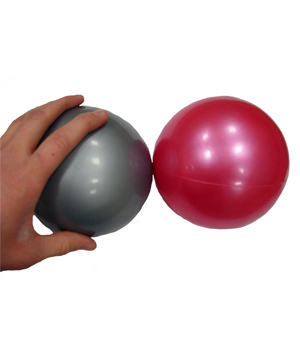 Weighted Pilates Balls can be used in place of hand weights for a more convenient grip! Choose from red, silver, or yellow in one or three pounds. These soft medicine balls are latex free with a cushioned slip-resistant grip. Add strength and core training to any workout routine by incorporating weighted balls. They are also a useful physical therapy tool and improve balance when placed under or atop certain parts of the body. These weights are perfect for my classes. They are easy to grip and more versatile then barbell weights. Love them! Great product, it was delivered sooner than expected and I am very happy with this weighted Pilates ball.